TAMPA, Fla. -- The University of South Florida may need to consider adding one more accolade to the growing list of accomplishments by faculty, students and staff. 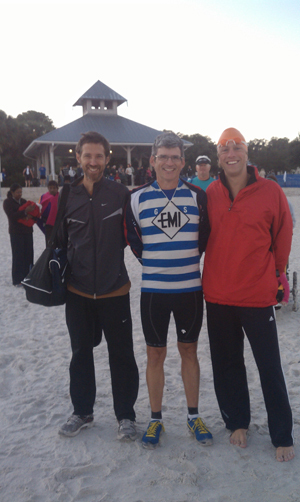 On Saturday, Oct. 22, USF philosophy professors Doug Jesseph, 52, Joshua Rayman, 42, and Michael Morris, 34, competed in the 21st annual Great Floridian Triathlon in Clermont, Fla. Adopting the moniker the Unholy Trinity, the three philosophy department professors placed first in the team category, completing the Ultra Distance’s 2.4 mile swim, 112 mile bike ride and 26.2 mile run in 10 hours, 10 minutes and 57 seconds. The team that came in second place completed the race in 11 hours, 30 minutes and 40 seconds. According to Jesseph, the idea to compete in the race was proposed by Morris during a department meeting. Even though Jesseph, Rayman and Morris have experience in their relay areas, they still trained as much as they could for event. “I was running 100 miles a week and then I bumped up to over 110 the last eight weeks so I was in tip-top shape for the race,” Rayman said. Jesseph added that Rayman also was training for the New York Marathon, which happened about two weeks after the Great Floridian Triathlon. The 100-mile a week runs, which sometimes included running to and from the USF campus to his home in Seminole Heights, paid off. “Out of 47,000 people that were running the marathon, he came in 131,” Jesseph said. Jesseph said he participated in a few triathlons during the summer, and was therefore doing a lot of biking, but to train for the Great Floridian he upped the amount of time he spent biking. That kind of training would serve Jesseph well during the triathlon because the bicycle course had a lot of uphill climbs and the day turned out to be extremely windy. Although Morris was unavailable during the time of the interview, Jesseph commended Morris’s performance in the race. Rayman and Jesseph begin to laugh as they recall Morris walking up to the starting line for the swim. Both Morris and Rayman placed first in the swim and run portions of the triathlon, respectively, with Jesseph placing a close second in the bike. Next, the trio plans to participate in the St. Anthony’s Triathlon in St. Petersburg, Fla. on April 27. Until April though, Jesseph jokingly declares a challenge to other university’s philosophy departments.